I found out about GoodBelly juice drinks from my local public radio station. Between shows they’d have an advertisement for the “non-dairy probiotic fruit juice based drink”. Intrigued I went off in search of this stuff. The first visit to the GoodBelly website suggested that my local Fred Meyers carried it, but when I went there it was not to be. I then tried a local Safeway(may also be known as Vons), which did indeed carry it, but it took some looking as it was near the yogurt and not on the juice aisle. So what exactly is in GoodBelly? Obviously it’s a fruit drink with probiotics, but getting in a bit deeper it appears they grow their own strains of B. Lactis & L. Planatarum299v from oat flour & barely malt which I imagine the little bacterias munch down on. While their test show that the product doesn’t contain detectable amounts of gluten, it is not considered a gluten free food. This is important if you suffer from Celiac Disease. 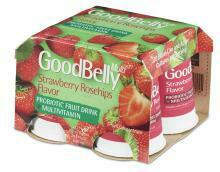 So basically you whirl some juice concentrate, fruit puree & probiotics together & you have GoodBelly. How does it taste? Pretty good actually! I tried the Bluberry Acai & the Strawberry flavors. There’s a slightly sour aftertaste to it, but it doesn’t taste bad. It is comparable to other juices you’d find on the market, just not as sweet(which is a good thing). I could not find the quart containers, so I had to use the little “Good Belly Plus shots”, which are about 2.7oz(80ml) each. There are usually some fruit seeds hanging out at the bottom of the container no matter how well you shake the darn things up. Was it effective? The little shots contain 20 billion colony forming units(CFUs), to me, this seems like too much. While their website does state “You can never get too much of a good thing”, I would have to disagree; especially for people just starting with probiotics. Much better to taper up with a small amount of probiotics to let your system adjust. Overall I experienced the same thing I’ve dealt with with other probiotics – constipation & bloating.There is such as thing as the “Herx Effect”, where you have to tough out these symptoms for days/weeks before you start feeling the benefits. However, I’ve tried toughing it out with other products and in the end I have to stop taking them because these symptoms do not subside. Thus, my search for the perfect probiotic continues. Importantly, do not take my experience for your own. Try the product, see how it works for you! We all have different bodies & mine is extremely picky. Bottom Line: It did not cure my IBS, but who knows about yours? Cost? Cost is a concern, it was about $3.50 for 4 little shots. You’re suppose to drink one per day. This could get pricey, especially when considering you can get a bottle for a months worth of probiotics in some cases for $10. You’re looking at $26.10 per month if you’re going to be drinking a GoodBelly a day. Keep in mind though that some of the higher quality probiotics are just as much and don’t offer as many CFUs, nor are they as tasty. GoodBelly does offer a $1.00 off coupon on their website. This lil’ coupon could save you quite a bit! It looks like you can only use it once per visit, but you could just do it with your weekly shopping & be good to go. The website has had it up there for months, hopefully they don’t take it down anytime soon. If you don’t have access to GoodBelly locally you can order some GoodBelly ToGo packets from Amazon.com . About 1:30 a.m. I woke up with diarrhea (2 months ago). I took immoduim and with no relief. I ended up after 6 weeks going to the doctor. After running some stool samples, all came back negative. After doing some online research, I decided that I have IBS. I happened upon GoodBelly at the store and decided to drink it–what did I have to lose? The cost was pricey, but I didn’t care. I have taken it now for 3 weeks and all my symptoms have disappeared. I’m on the mend. I ordered the packets to take with me when I travel and did get the 2 for 1 price. Also, on the inside of the cartons of GoodBelly, are 50 cent off coupons. I highly recommend this stuff. I saved me many trips to the bathroom, and extra rolls of toilet paper. Glad to hear you’ve found something that works. Perhaps acting quickly is the key to your success, many aren’t sure what they have for months or years. I have always had a lot of “churning” in my gut and problems with constipation or diarrhea (seemed I was always on an extreme). Finally after a colonoscopy it was revealed that I had diverticulosis, so there is another reason not to strain and to keep my colon happy. I started taking the GoodBelly shots every day. I totally agree with GoldenFoxx–it is worth every penny! I realized after a few days, no more “churning” in my gut and totally regular, easy bowel movements, which was something I’d never experienced. This really has changed my life and I think it is worth a try for anyone with issues! Be careful when treating oneself with medicine/supplements. 15-20 billion parts is a large colony number. Most pills are in the 1 billion range. Remember that probiotics (bacteria) *warm*. I tried 2 in a day to get started and then made the mistake of having half a glass of wine that same evening. Woke up with a splitting headache in the middle of the night. Hasn’t affected my digestion that much. Stools turned lighter color. I wonder if anyone is still monitoring this site?? I have been on oxycodone for 5 days and only just realized I have not gone to the bathroom for about 4 days now. I was told Good Belly would work for me. I don’t want to take the grocery store brand stuff, want to keep things natural if possible. Was also reading if you’re not experienced with probiotic stuff you need to take it slow. Or something like that. I have already drank about 10 oz of this stuff. Is this what I need? Will it work or should I go to rite aid and buy one of their products? After 4 days I still have no urge to go… I’m thinking I need to somehow make it happen, I just don’t know how. Usually probiotics are suggested for those with regular constipation or diarrhea. If it’s an acute bout from something like pain killers, you’ll probably need something quicker acting. Often fruit juices and foods with a lot of FODMAPs(https://en.wikipedia.org/wiki/FODMAP) and/or high in dietary fiber(oatmeal) can get the gut going. Caffeine/Coffee also seems to cause bowel movements in some people, but science hasn’t shown a link. If you are still having problems you’ll probably want to try a gentle laxative or talk to your doctor. So idk if it was what I ate, but I ate it yesterday so I’m thinking is not, I took the good belly 8oz today for first time and all day I’ve had horrible pain in upper right side, which I thought my gall bladder since I have issues at times with that, but it seems to move now in the evening to where my whole stomach, most on right side upper, hurt and I have gas,constipated, I’ve been miserable all day today, is this normal? Took this juice a few hours ago, now i am dumping water , this is my eigth day of the 12 day reboot, is this suppose to happen? Leave a Reply to JL!